This page explains which weight lifting supplements you should take to get the most out of your diet and training. I list the most effective supplements and describe how they can help to optimize your results. Find the right supplements for your goals. Look at reviews for the best health, performance-enhancing, weight loss, weight gain, and muscle building supplements. On this page, I also tell you how to avoid the multitude of ineffective and overpriced products that deliver nothing but empty promises. Hopefully, this guide will help give you the know-how needed to get results without falling prey to scams or putting a dent in your wallet. This weight lifting supplement guide is based on science and experience. I have used all of the products that I am recommending. If you have a question you’d like to have answered after browsing through this post, then feel free to ask it on Weight Lifting Questions and Answers. Amplify Your Results. Weight lifting supplements are very effective tools for accelerating progress. They can bring you to the next level of results and performance faster than you could with just diet, hard work, and rest. However, choosing the right supplements is difficult, especially if you’re new to the fitness scene. Buyer Beware. The supplement industry is saturated with many misleading products that have shiny labels and false claims. Even worse, and more often than not, the levels of each ingredient listed in the “proprietary blends” are unable to be measured and are often severely watered down. Don’t Pay for the Placebo Effect!… Be wary of products with a lot of hype and extreme claims. They are not worth the price. Many people waste money on useless supplements, and then report improved gains because they had high expectations and subconsciously worked harder or ate better. That’s the placebo effect at its darnedest. Diet. Make sure you are eating enough (or not too many) calories and protein. This includes having a pre-workout and post-workout meal for performance and recovery. Routine. You should have already made some noticeable progress in strength and size. If you’ve stalled, modify your routine or just try a new one. Rest. Rest is the only time you grow. Sleeping at least 7-8 hours per night is necessary for good results. In addition, be sure you have enough recovery time between workouts. Money. Be sure that your money is going towards quality food (and basic supplements: multivitamin, whey, vitamin D, fish oil) before supplements. If that’s all taken care of, then supplements are a great investment for an added boost to your progress! The rest of this guide teaches you which products are the smartest investments. …If you’re not as healthy as you could be and/or can’t meet your daily protein requirements, then other supplements are rendered all but useless. Multivitamins. A multivitamin/multimineral is the first supplement I recommend to anyone I know, weight lifter or not. The obscene number of health benefits makes it a no-brainer for anyone, especially the serious lifter. I find it particularly helpful for staving off illness and making up for those times I “forget” to eat my veggies. Whey Protein. The most efficient and convenient supp for muscle building and repair. Just one scoop packs 20+ grams of protein, making your daily protein needs a whole lot easier to reach. I can’t tell you how many times it saved me when rushing to class. I just pop two scoops in my shaker, mixed with some water and carbs, and I’m out the door – See related article: whey protein side effects exist? Fish Oil. Who knew fish fat would be so good for you? Improved performance and superior body and mind functioning are just the beginning of fish oil’s benefits. I feel like I’m slightly more on top of things when taking fish oils vs. not. However, the health benefits are most important to me. Vitamin D. Also known as the sunshine vitamin, Vitamin D is unique in that your body can produce it when exposed to UV rays. It’s critical for a strong and healthy body, and is actually considered a steroid hormone! However, according to recent research, you are likely deficient and need a lot more than you’re getting. The next level up from the foundational supps. These are the supplements that get all the glory, and rightfully so. They provide that extra edge needed to truly maximize your potential and realize the full benefits of all your hard work. Caffeine Supplements. Nothing like the eneregy of a large cup of coffee crammed into a tiny pill to get you amped up for a balls-to-the-walls workout. Caffeine is super cheap and better than many expensive pre-workout supplements (cheaper than coffee, too). I love taking caffeine before a workout because I “zone in” and experience an intense focus on the lifts – no distractions. Remember that the only time you build muscle mass is during rest while recovering from intense workouts. You can optimize your sleep and recovery with one of the following weight lifting supplements. Melatonin. This naturally occurring hormone helps you sleep better, although more will not make you go to sleep quicker. But once you do fall asleep, it is usually deeper and with fewer interruptions. When I take it, I sleep better and wake up rejuvenated the next morning, but only when I know I can get 7-8 hours of sleep (to avoid drowsiness). Follow this melatonin dosage guide. Check Back Later. Be sure to bookmark this page and come back later because I will continue to add more weight lifting supplement reviews. 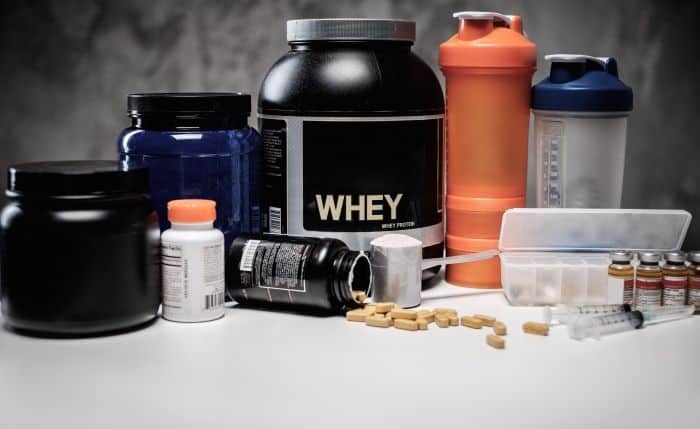 I hope this guide has helped you find some great weight lifting and bodybuilding supplements that won’t break your budget and force you to file for bankruptcy. Nobody should have to spend hundreds of dollars to look good and be strong! im looking to start lifting i want to have some bulk but be ripped abbs and all and im starting to look more serious id like to know what should i buy to jump and is there a diet plan i could set for myself that you use ? All seem important, but am I missing anything besides my protein choice? Or is there anything else i should be taking?